A great way to start your child back to school is by taking them to a special breakfast or dinner the day they start back to school. One of our favorite places to eat especially when we are traveling is Cracker Barrel. Before I go any further, I should fully disclose that I worked at a Cracker Barrel for a few months right after high school before I went off to college as a server. Everybody always wanted their refill on Cracker Barrel biscuits and always wanted the blackberry jam, which we would have to dig for in the jam basket! Those were a few fun months! Before I went veggie-tarian, my favorite dishes were the hash brown casserole, grilled chicken, and egg in a biscuit! One of my breakfast favorites is the blackberry pancakes. Yummy! My mouth is watering just thinking about those! Cracker Barrel is one of those places you just feel at home. The kids can play games while you wait to be serve and the kids always clean their plates! Plus, while you are waiting to be seated, you can shop around in the Cracker Barrel Store, where you will always find amazing treats and gifts! A supporter of Country Music and the Grand Ole Opry, you can find more information on the albums sold exclusively at Cracker Barrel. 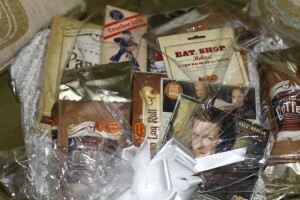 Part of the gift basket giveaway includes exclusive music available at Cracker Barrel. Cracker Barrel wants to please YOU, which is their simple mission. They are offering one lucky Bargain Briana reader a Cracker Barrel prize package worth $100 including a $25 Cracker Barrel gift card! 1. Leave a comment with your favorite Cracker Barrel dish! This giveaway was sponsored by Cracker Barrel as part of Win Giveaways Back to School Bash. This Post was written by me and was not edited by the sponsor. Read more on my Disclosure Policy. Find more information on the terms for this giveaway on the Win Giveaways Facebook page. Saturday “Chicken and Rice” is the BEST dish! the biscuits & gravy are wonderful. I love the grilled and chicken pineapple salad. I love their chicken n dumplings. Meatloaf, mashed potatoes and mac n cheese! I love the biscuits and gravy. Pancakes, eggs, bacon & biscuits for anytime breakfast. Fish and Chips on Fridays. The Vegetarian Sampler is my favorite, and I always get it with the Mac and Cheese which is fabulous! I actually just got back from lunch at Cracker Barrel just a few minutes ago. My favorite thing there is the chicken fried steak (or is it chicken fried chicken?). Pretty much everything there is great though and I love their fried okra. My husband and I LOVE their Friday night fish special and get that frequently. I also love their meatloaf. Thanks. I like the fish and shrimp dish. I love all their breakfast food, the hashbrowns the best! For dessert the brownie cobbler is best! Cracker Barrel has a great burger, it’s really big and not made from some frozen patty. I always get the pinto beans and corn bread muffins, they taste like what my grandma used to make. Cracker Barrel has really good coleslaw. The biscuits and gravy are so good no matter what time of the day it is. Cracker Barrel’s ham steaks are the greatest. I’ve always LOVED their hashbrown casserole. I have never eaten at a Cracker Barrell restaurant but would love to try it via a gift basket. Hashbrown casserole with everything else! I love the meatloaf dinner. grilled chicken salad is really yummy! My favorite dish is Chocolate Cobbler! I like the Traditional Breakfast Sunrise Sampler. Thank you for the great give-away. My favorite is the country fried steak with gravy. Without a doubt, my favorite Cracker Barrel meal would be the Chicken and Dumplings – with baked apples and Mac n Cheese on the side, of course! I love the beans and cornbread! My favorite dish is their Hashbrown Casserole. And I love playing checkers when we’re traveling with grandchildren and waiting for the food to be served! My Favorite thing to eat at Cracker Barrel is Blueberry Pancakes and a double order of apple Cinnamon slices on the side! We could start with meatloaf. My favorite dish is the Chicken and Dumplings, which I always have with Sweet Potatoes and Sweet Tea! Yummy! I’m cuckoo for Cracker Barrell biscuits. Yum! I love the Roasted Turkey. Hashbrown Casserole is the best! I love their Country Fried Steak. I subscribe through my yahoo reader. The Campfire Chicken is wonderful! I also subscribe to your email! I love their salads!! The chef one is to die for! I love their mac and cheese! Already subscribe to your emial newsletter. Already “like” Bargain Briana on Facebook. Become a Facebook Liker of Bargain Briana on Facebook. The chicken livers are fantastic! My most favorite dish at Cracker Barrel is the Hash Brown Casserole. I love just about everything on the menu, and my family loves to eat there! I absolutely love hash brown casserole! My favorite is the veggie plate. I don’t know about a favorite dish, as I love it all! Guess I will go with chicken fried steak. My favorite Cracker Barrel dish is: Baked Apple Dumplins! Sure wish I had some now! My favorite dish is the Grilled Chicken Salad!! love the mac and cheese! I love the chicken and dumplings from CB! My fav Cracker Barrel Dish (today) is the Farmer’s Breakfast! I tweeted your message on Twitter! I love chicken and dumplings, so good. My favorite Cracker Barrel Dish is Chicken N’ Dumplins. Never tried any Cracker Barrel items, would be a treat to win and give them a try! I love their cornbread, and we order on the side of whatever we get for the meal. Yum! All I eat is their breakfast! My favorite is the hashbrown casserole. My favorite Cracker Barrel dish is their Country Style Steak with Gravy and Mashed Potatoes. I like their fried fish! And hash brown casserole, and fried apples. I love the spicy grilled catfish! Biscuits and gravy!! Those are the best! My favorite is the bisuits and gravy. I like Bargain Briana on facebook!! I really enjoy their catfish meal. I also subscribe to you via Google Reader. I’m ALWAYS a fan of you on FB. Love getting your updates on there! My favorite is a nice stack of pancakes! Oh yeah! Cracker Barrel is awesome and I would love to win this prize to share with my family. I think we would fully enjoy each and every item on that list! I subscribe to my free newsletter via email. I am a Facebook Liker of Bargain Briana on Facebook. Cracker Barrel’s Chicken and Dumplings are my favorite. My husband and I ate there the day after our wedding and had strawberry waffles. Definitely the hashbrown casserole with the grilled chicken tenderloins being a close second. UNLESS we are talking dessert and then it is…….drumroll………THE COCA COLA CAKE!!!!!!!!!! My favorite is chicken and dumplings. i love their cheesy hash brown casserole. Love the chicken & rice. I follow Bargain Briana on Facebook. I love their grilled pork chop plate. I love Cracker Barrel pancakes! I love their corn bread and beef stew! I love their biscuits and home cooking oh and gift shopping 2 :) Im a fan on fb and receive emails. I love the Sunday chicken with baby carrots and hashbrown cassrole. My husband and I love Cracker Barrel!! I love cracker barrel’s meatloaf sandwich. I like the hashbrown casserole. I know it’s not a true meal, but I love their fried apples dish! Love the macaroni and cheese! My favorite is the Fried Catfish. I luv, luv, luv, their fried apples, thanks. I love the smoother pork chops. I love, love the hashbrown casserole! I usually get the Sunrise Sampler with extra biscuits, but their pancakes are wonderful too! I like the chicken and dumplings. I love the grilled chicken tenders! I love their breakfasts and fried chicken! I love the biscuits and the stewed apples! I love the Mamma’s Pancake Breakfast! Chicken and dumplings, oh the trout was excellent the lasts time I had gone! They have the best chicken and dumplings! They are the best around! The smokehouse breakfast cannot be outmatched! My favorite dish is hashbrown casserole. I love their chicken-fried steak. My kids love their green beans which is great because they rarely eat a vegetable. My favorite dish at Cracker Barrel is their Roast Beef and Gravy dinner with mashed potatoes and dumplings. It’s so good. I have not been back to the cracker barrel in over 15 years. I would love to take my family there and have a country home cook meal. I Tweeted about the Giveaway as @mamawantstowin. I Liked Bargain Briana on Facebook as Christy Marie. My favorite dish from Cracker Barrel is the Broccoli Cheese Chicken, which is the dinner special on Wednesday nights. Seriously, I love them all. Just like grandma used to cook. Yum. I love their half roast beef sandwich with the half cup of bean soup. We love Cracker Barrel!! Cinnamon apples are a must! Sometimes I go there to just shop the store. I have actually asked to buy the shopping wicker baskets for my collection. Thier country fried steak dinner is my favorite. I love their pancakes with fried apples and whipped cream on the top. I like their chicken n dumplings! Our favorite meal is Momma’s Pancake Breakfast with the blueberry pancakes. I follow by e-mail. Love the biscuits and blackberry jam! I love, love, love the grilled chicken tenders and their lemon ice box pie. A real fan of the chicken and dumplings! I like their Wild Maine Blueberry Pancakes. and the fried apples. My favorite. Their chicken fried steak is the best! I am a liker on Facebook!! Love your blog!!! My husband and I love their biscuits and gravy!!! I also subscribe to Bargain Briana’s e-mails. I haven’t had Cracker Barrel in a long time, but I remember liking their hash browns! Me and my grama always go to CB and I always end up getting scrambled eggs, bacon, toast and the hashbrown casserole. MY FAVORITE!!!! Mmmm….is there anything I DON”T like at Cracker Barrel?! I like the turkey and dressing, etc. but I usually order breakfast and the fried apples. Mmmm. Country ham is my fav! Weird but one of my favorite things at Crack Barrel is the Apple Butter – can’t get enough of it. I love their cheesy hash browns….yum! Cracker Barrells Chicken and Dumplings RULE! I LOVE Ruby’s Dressed Up Chicken Sandwich with Onion Rings!!! I also am a subscriber to your RSS feed. I love their Country Breakfast, their biscuits are the best! love the chicken and dumplings! spicy grilled catfish, ummmmm ! I like their fried chicken tenderloin with macaroni and cheese and dumplins. I love the Chicken & Dumpling and the Hashbrown casserole!!! Their Chicken & Dumplings is superlicious!! The grilled chicken tenders melt in your mouth. No bbq sauce needed. The seasoning is to perfection, plus it’s a healthier option on the menu! Meatloaf, Hasbrown Casserole and fried apples. I love the hasbrown casserole, too! We ate there this past Sunday and had the Sunday Dinner fried chicken and I thought it was awesome. Since the closest Cracker and Barrel is an hour away I have not yet had the pleasure of trying their food! Hopefully I win! My Favorite is their chicken and dumplings. Love the chicken fried steak! I love the fried apples! I love cracker barrell breakfast, and they serve it all day!!!! My favorite breakfast item is always the biscuits and gravey, the warm apples are also amazing!!! my favorite dish is any breakfast…we love breakfast in this house. I love to eat breakfast there, I usually order Pancakes with a half order of sausage and biscuits. We love the biscuits and gravy. Thanks. I love Cracker Barrel hashbrown casserole and have actually learned how to make it at home!!! It’s been a long time since I’ve been to Cracker Barrel, but I used to like those egg things that were only available for a limited time in the mornings. I think I only ever tried them once because they were always sold out by the time we got there! I love their chicken and rice!! Its so yummy. I like their mac n cheese. Love this giveaway – could spend it all in the gift shop! I’m subscribed to your newsletter, thanks! My favorie Cracker Barrel menu item is the Hickory Smoked COUNTRY HAM dinner plate. I love the grandmas breakfast. I always get it! Love eating at Cracker Barrel! Love their biscuits & cornbread! I subscribe via email, and follower on FB :) Thanks! chicken and dumplings– best I’ve found other than mine, and this way I don’t have to cook. I love their catfish and country fried shrimp. Their grits are awesome! Would love to win this to take the family out to dinner. My favorite Cracker Barrel dish is their Chocolate Cobbler. It is the best I have ever tasted! I like Chicken and Dumplings. I love their meatloaf, especially since my husband doesn’t like it so I can’t fix it at home. I love their grilled chicken! The smokehouse breakfast is also one of my favs. I haven’t eaten at Cracker Barrel enough to know my favorite menu item – but we have one near us and I’d love to try it. I am subcrbed to your newlettr via e-mai. I love the veggie platter; mac and cheese and double okra! I am a like of bargain briana on facebook. I really like the bacon cheddar burger melt with onion rings and fries. I LOVE their coca-cola cake, but it’s seasonal….so not always available. I also love their chicken and dumplings. YUM! Before I went gluten free my fav was PANCAKES for dinner! I just moved away from Nashville so this would help with the missing part! I love their salad with the pineapple on it…yum! I love their Biscuits and Gravy. The biscuits with apple jelly!! Hashbrown casserole and chicken and dumplings! Frequent there ofter with the family in tow! Anything on the breakfast menu. Hashbrowns are great! Like Bargain Brian on facebook. I love their hashbrown casserole! grilled chicken dish. so good. I subscribe to your e mails – Thanks!! I liked you on facebook – Thanks!! favorite is BLT on sour dough bread – Thanks! I love their grille chicken. The cobb salad for sure. I love the chicken and dumplings with fried okra! Love the chicken and dumplin’s! I’m a subscriber to the newsletter .Thanks! I love the chicken and dumplings! And I always ask for grilled sourdough bread instead of biscuits or cornbread. . . Already am an email subscriber. I subscribe via email RSS. I’ve never been, but after this post, we’re definitely going. Gotta check out those blackberry pancakes! Is breakfast a dish? Because I love their breakfasts. I subscribe to your newsletter emails. I love their country gravy. Beef stew hands down. Love the way they serve it – tender juicy goodness! I like the chicken BLT and fries. so very hard to pick just one fave…but hash brown casserole is it! Our family loves Cracker Barrel. I love their sweet carrots!! I am already a LIKER on Facebook for Barg. Br.